Eggplants are one of the most used ingredients in Sicilian cooking. The eggplant is without a doubt the star of the show in this recipe! When you think of Sicilian gastronomy, one of the first ingredients that comes to mind is the eggplant. During a recent trip to Sicily, the number of dishes featuring eggplant I sampled was mind-boggling. The record was five dishes during one meal! Allow me to list them: grilled eggplant; caponata crostini; eggplant flan; eggplant involtini and baked maccaruna with eggplant. Too much eggplant you say? Not at all as each dish was quite distinct. We enjoyed these dishes, and more, at an incredible restaurant in the province of Messina, Sicily. Stay tuned for my upcoming post on Messina! 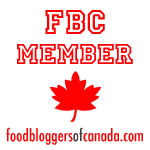 For now, let me tell you about two popular eggplant dishes that I have already shared with you. Eggplant parmigiana, made in my mom’s unique way with mortadella slices and hard boiled eggs (you just have to taste it). Then there is Pasta alla Norma which is basically a pasta dish with eggplant and ricotta salata. Two favourites that you really must try if you haven’t already! 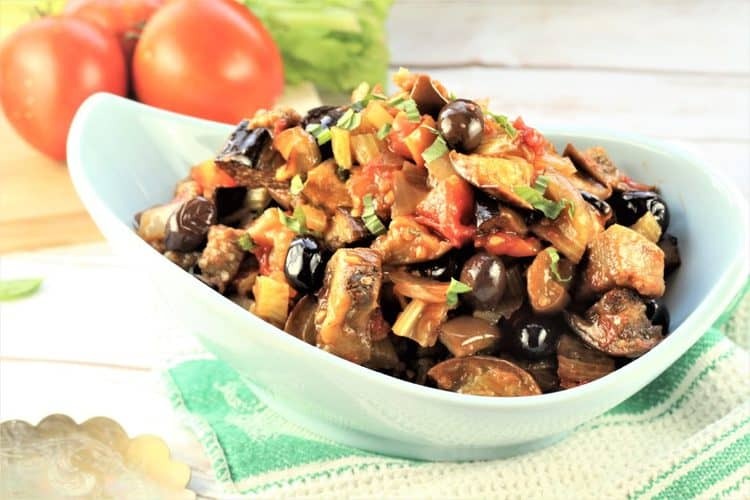 Finally, there is Eggplant Caponata, the sweet and sour eggplant dish that Sicily is also famous for. 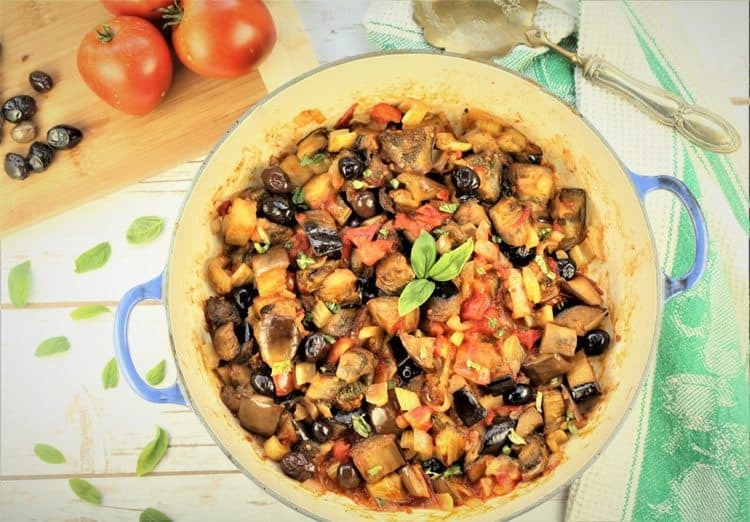 This blend of eggplant, onion, celery, tomatoes and olives has a unique flavour due to the addition of sugar and red wine vinegar that take this dish to a whole new level. I used this beauty from my garden to make my caponata. 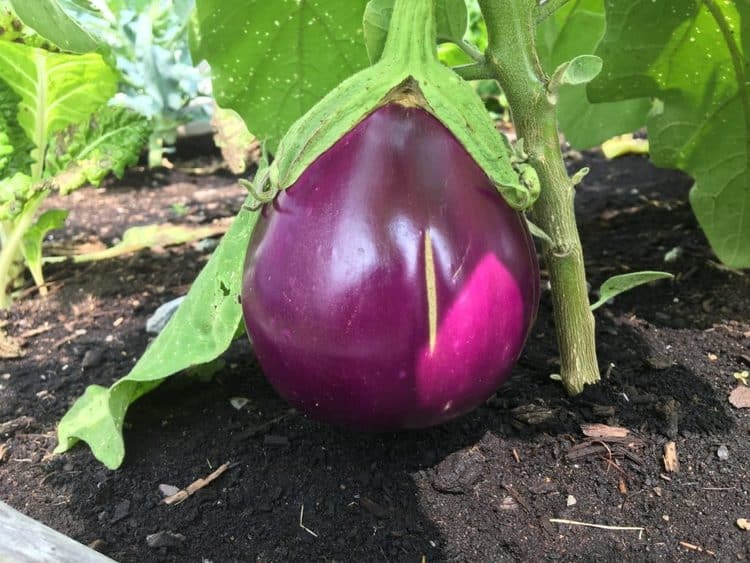 This variety of Italian eggplant is perfect for making caponata and after years of trying, I finally had some luck growing them in my garden this summer! I also added fresh tomatoes from my garden, but in a pinch you can also use canned whole tomatoes. Capers are a traditional ingredient in caponata but they are not too popular at our house so I left them out. Also, caponata is usually made with green olives. However, I brought back a batch of my favourite black olives, cured by my lovely cousin in Sicily. I decided I needed to incorporate them in my caponata. It was just as delicious! How do I cook the eggplant? The eggplant in caponata is also usually fried, but given my aversion to frying unless absolutely necessary, I oven roasted mine. You do need to generously coat your eggplant with olive oil in order to prevent it from drying out. But after lots of experimenting with this recipe I was most satisfied with the oven roasting method. It is fuss free and I like how each piece of eggplant becomes evenly roasted. This method also saves you some time. While the eggplant is cooking, you can prepare the remaining ingredients and toss in the eggplant during the last few minutes of cooking. Another wonderful thing about caponata is that it tastes better at room temperature or even the following day. This is a dish that gets better with time, so you can definitely keep it in the fridge for a few days. Let it come to room temperature before serving. 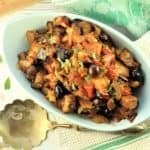 I enjoy Eggplant Caponata as a side dish but it is hearty enough to enjoy as a main dish alongside some fresh, crusty Italian bread. As I mentioned earlier, we sampled it on a crostini at a restaurant in Sicily. Let me see how you serve yours by tagging me on Instagram or Facebook with #mangiabedda or @mangiabedda. Buon appetito! 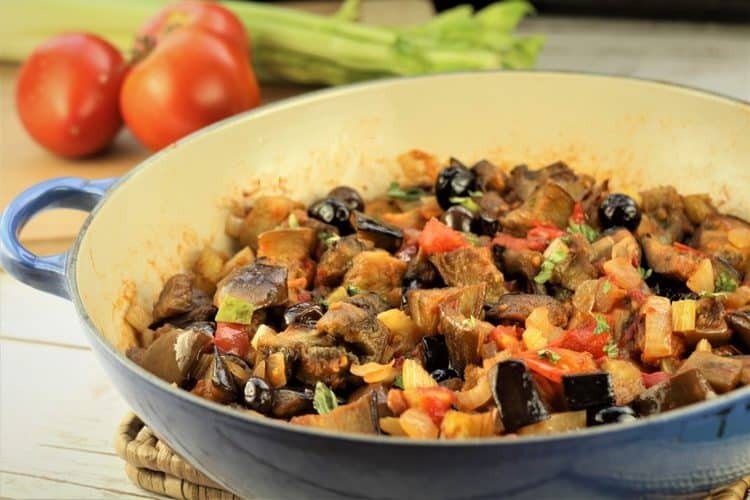 Eggplant Caponata is an iconic Sicilian dish, distinctive for it's sweet and sour flavour. It is best served at room temperature and keeps well refrigerated for several days. 6 tbsp. olive oil plus 2 tbsp. 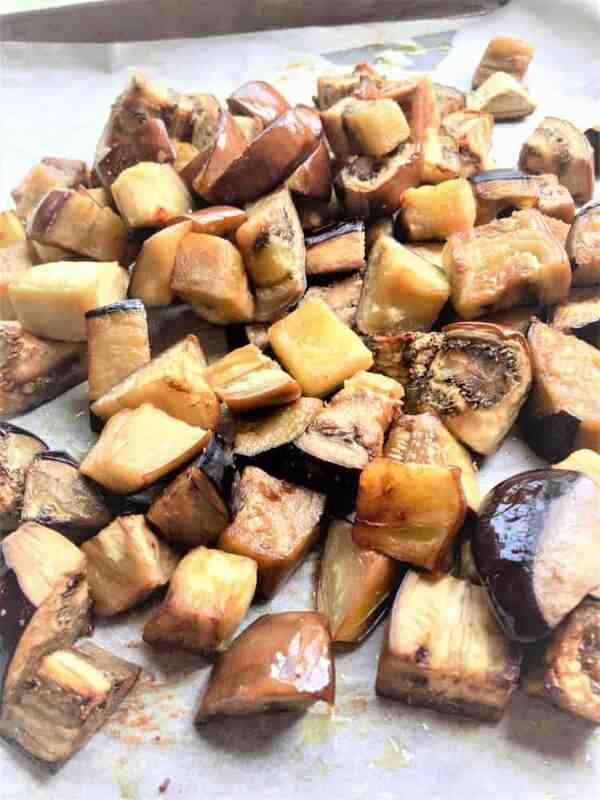 Cut the eggplants into approximate 1 inch cubes. Place in a large bowl, salt generously and cover with water. Let sit for 30 minutes to 1 hour. Drain, rinse and pat dry. Preheat oven to 400F and cover 2 baking sheets with parchment paper. Distribute the eggplant cubes in the pans and toss with 3 tbsp. of olive oil in each pan. Bake for 30 minutes, tossing halfway through cooking. Meanwhile, in a large skillet heat 2 tbsp. olive oil on medium-high heat, add onion, cook for 3 minutes. Stir in celery, add a pinch of salt, lower heat, cover the pan and let the celery cook for 5 minutes. Remove the lid, increase heat to medium-high, add tomatoes and cook for 5 minutes. Add the olives, sugar, red wine vinegar and simmer for 5 minutes. Stir in the roasted eggplant and continue to simmer for 5 more minutes. Adjust the seasoning, if necessary. Remove from heat and stir in the basil. Serve hot, at room temperature. Caponata can also be refrigerated for several days. Allow to come to room temperature before serving. 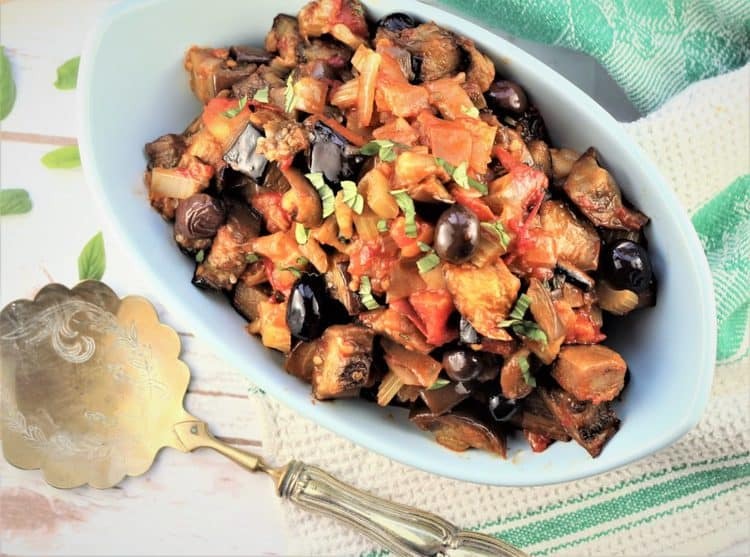 I have been wanting to make homemade eggplant caponata for the longest time! Thank you for sharing! Hi Anne, you're so very welcome! Thanks for stopping by!